Blogging Question Answered – Generate Traffic, Earning etc. Today I’m going to answer the top blogging question and If you have any question then feel free to comment and we will include in the next articles. 1. In How Many Words you Should Write your Post? Answer – You should write at least 2,000 words per article but my recommendation is to don’t focus on words, focus on the content quality. For example: if you write a post “Meaning of Deep” then you don’t suppose to write extremely long content. Just cover all the topics, don’t care about words. 2. How to Start a blog in No time? Answer – To create a blog in 10 minutes just go to blogger.com and log in to your Google account, choose your blog name and that’s sit. 3. What is the Best Way to Build Backlinks? Answer – Read our Article regarding “How to get high-quality Backlinks to your Blog Post” and you will start generating lots of backlinks. 4. How Do I Drive Traffic to My Blog for Free? Answer – Here is the article regarding “Proven Ways to Get traffic to your Blog“, read this article and you will start generating traffic to your blog. 5. How to Attract 1000 Visitors a Day on your Blog? Answer – Stay active on platforms like Facebook, Twitter, Instagram, Quora, Google Plus, Linkedin, Stumbleupon, Reddit and post regularly. Also, Post on Right Time for your Audience. 6. Where I can Find Viral Content for my Blog? Answer – Use Google Trends and BuzzSumo to find Viral Content for your Blog. If you want a complete tutorial just leave a comment. 7. What is the Best Keyword Research Tool? Answer – You can use google keyword planner and kwfinder to find the best keywords for my blog. 8. Where I can Find Longtail Keyword for My Article? Answer – You can use the free version of keywordtool.io to find the long tail keywords for your blog. 9. Is using photos found on Google for a blog post illegal? Answer – Yes, you can’t use photos found on google but you can use the website like pixabay.com and pexels.com to get copyright free images. 10. Do you think it is a Good Idea to create a Blog Anonymously? Answer – It depends on you, I won’t recommend blogging anonymously but it fully depends on your decision. 11. How can I get more viewers for my technical blog? Answer – For tech blog, it is mandatory to regularly update your content, if you regularly update your content with best SEO practices then your blog will be boosted. 12. How much do you earn with a blog? Answer – You can earn the unlimited amount of money from blogging, if you are consistent then you are going to rock. 13. Google Adsense vs Affiliate Marketing? Which is Best? Answer – If you have less traffic then use Google adsense and if you have more traffic then you can use affiliate marketing. But remember that your products must be related to your website. 14. Could you make $2000 a month as a full-time blogger? Answer – Yes, you can make $2000 a month very easily, you just need to be consistent with Best SEO Practices. 15. Which is the Best SEO Tools? 16. Which platform is better for blogging, Blogger or Shopify or WordPress? Answer – I recommend Blogger and WordPress for Blogging and for the ecommerce site, I recommend Shopify. And detailed comparision between Blogger and wordpress is here – Blogger Vs WordPress. 17. How do you deal with online haters? Answer – Just Ignore them, haters are everywhere. 18. What is the fastest way to increase my website ranking in Google search engine? Answer – First, submit a Sitemap to Google and then after every post completed don’t forget to submit the URL to Google. 19. What is a good way to increase engagement on a website? Answer – Ask a question to your readers, Email them on Regular Basis, Reply to Every Comment, Engage them on your Social Media. 20. What are Some Best Blogging Tools? Answer – Here are the 11 Blogging tools that every blogger should use. 21. What are suggestions for some topics if I want to write articles and blogs? Answer – You can use Buzzsumo to generate some content Idea for your Blog. If you want a detailed tutorial, just leave a comment. 22. What are the Best Blogs that Accept Guest Post? 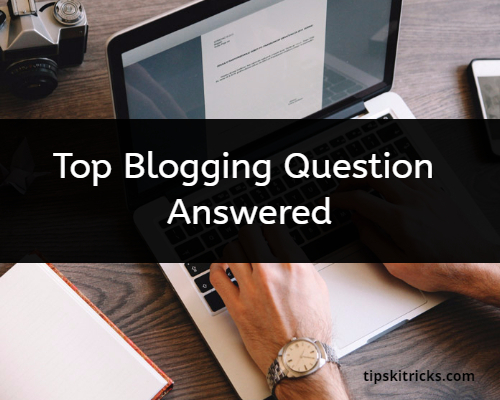 Answer – I have a list of Top blogs that accept guest post, make sure to check this out. 23. How to Create Infographics for your Blog? Answer – There are some Freemium tools like Canva.com and snappa.com, and some premium tools like infogram. 24. What steps should I take to grow traffic to my blog? Answer – Getting traffic on your blog is not easy but very much possible. Just create amazing content more than 2,000+ words (Super In-depth). After continuously creating amazing content, your views will boost in J Graph. 25. How can I get more comments on my blog? Answer – At the end of the article, just ask a question related to your article and people will start commenting on your blog. 26. How do I increase traffic to my blog using Quora? Answer – First, Choose your Category in which you are expert, for example, “Blogging” now answer the maximum question as possible in a week. Now, On every 4th answer Insert your Blog link. Don’t copy paste just write naturally for each question and over time your traffic will increase over time. 27. Who earns more, a YouTuber or a blogger? Answer – If Youtubers have 10 Thousand Subscriber and Blogger have 5 Thousand Subscribers then I can guarantee that Blogger will earn more. It’s all about traffic. Checkout clash between Youtube vs Blogging. 28. How to Sell Ebooks on your Blog? Answer – If you are expert in any field then create an ebook and upload it on Instamojo (For India) or Gumroad (For World) and then Embed it on your blog then Start earning from it. 29. How long can we start earning revenue by blogging? Answer – If you are consistent, an average you will start making money in 6 months. Try 2,000+ Word Blog post in the beginning. 30. What are the Cheapest Ways to get Traffic to your Blog? Answer – Use Facebook ads to get the cheapest traffic to your blog. First, learn Facebook Advertising and then Go for it. 31. How to get More Traffic on Ecommerce Blog? Answer – Here are the Few SEO tips for Ecommerce, learn this technique and over time you will get more traffic. 32. How can I decrease My Bounce Rate on My blog? Answer – Simply, Interlink your older relevant post on your blog, use some top floating bar to attract people to click but the most important things in the themes. Your themes must be professional so visitors can fall in love with your blog. 33. Blogger vs WordPress? Which is Best? Answer – Both are best for SEO and writing content, if you are beginner then go for blogger, if you are expert then go for WordPress. 34. How to Increase Dwell Time on your Blog? Answer – To increase the Dwell time, make sure that your paragraph cannot contain more than 4 lines. Make sure to remove large images, just focus on content. 35. Which is Best Adnetwork for a Blog? 36. How many blog posts do I need to begin with to get traffic? Answer – There is no limit someone writes 500 posts and generate 5,000 views daily, on the other hand, someone has written 100 posts can generate 10,000 views a day. It depends on Quality Content. 37. How to Add Contact form in Blogger Blog? Answer – Here is Step by Step guide to Add Contact form in Blogger. Answer – I’ve Breakdown an Amazing guide on How to Become Successful Blogger. Check that Article! 39. Adsense vs Media.net? Which is Best? Answer – I think both pays equally but media.net pays higher if your traffic is from united states and if your traffic is from around the globe then you google adsense. 40. Is it necessary to have a laptop for blogging? Answer – Yes, It is necessary to have laptop or pc for professional blogging. Hope, you like this amazing articles related to blogging. Ask your Question, so that Next Time I Can Answer It Again.